IIM Shillong begins its first academic session this month. But can it match up to the standards of its eponymous forebears? BT's J. Bhattacharjee draws a comparison. 2004: To B or not to B? 2003: What makes IIM-A dominate? When the US celebrates its Independence Day on July 4 this year, Shillong will also have something to cheer about. That day, the newest Indian Institute of Management (IIM) will open its doors for the first time. 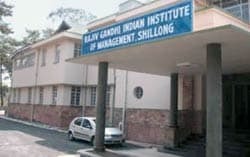 Christened Rajiv Gandhi Indian Institute of Management (RGIIM), it will begin its first academic session with 71 students. RGIIM-S, which currently operates out of the Mayurbhanj Complex in Nongthymmai in uptown Shillong, will move to a new 120-acre campus in Mawdiangdiang, 20 km from the city centre, in about two years. “This new IIM will benefit the region in terms of human resource development, and enable a larger number of students to wear the IIM tag,” says Ashoke K. Dutta, the new Director of RGIIM Shillong, who is an alumnus of IIM Calcutta and has worked for more than 30 years in the corporate world and in Indian media houses. RGIIM-S, which will begin with the regular Post Graduate Diploma in Business Management this year and later include a Fellowship Programme in Management and Management Development Programmes, attracted nearly 10,000 applicants for 60 seats that it had originally planned to open with. “But seeing the response, we increased our intake to 71 students,” says a proud Dutta. RGIIM-S Chairman Rathin Dutta says the credit for the huge response is not entirely theirs. “The state government has been extremely supportive in getting RGIIMS up in a record time,” he adds. RGIIM-S, which is starting with a ninemember faculty, will beef it up as it introduces more courses and increases its student intake to 120 in the third year and 180 in the sixth year. Then, to ensure RGIIM-S’s relevance to the region, Ashoke Dutta has proposed a special centre for short-term certificate courses exclusively for students from the North East. “Given the highly competitive nature of selection for the IIMs, we fear that a sufficient number of students may not make it to RGIIM-S from within the region. So, we have proposed to the Department for Development of North East Region to allow us to set up a Centre for Development of the North Eastern Region. The ministry has in principle agreed to open this centre,” he says. Like any start-up, RGIIM-S is also facing its share of problems. It still does not have a full-strength administrative staff. The Director is, in fact, functioning without any personal staff. Work on equipping the institute with state-of-the-art IT infrastructure, including WI-FI-enabled Internet access, has also been delayed. The author is a Shillong-based freelance journalist.